Free use of the Acorn Fitness gym next to the hotel. Hair and Beauty Salon in hotel with good range of treatments . The Copthorne London Gatwick is situated in the village of Copthorne, centred around a 16th Century farmhouse and set in 100 acres of garden and woodlands, only minutes from the airport. Dining options include the Lion D'or fine dining restaurant and guests can use the Acorn Fitness gym which is adjacent to the hotel. All rooms are double glazed, have en-suite bathroom, tea and coffee tray, TV, Iron and ironing board, mini fridge, laptop safe and hair dryer. One room in the hotel is suitable, please advise at the time of booking. Parking is on site in the hotel car park. You will need to leave your car keys at the hotel. Transfers run to the airport every hour between 04:15 and 23:15 - outside these hours taxis can be booked at clients own cost - the local taxi company rates start from £11.50 each way. On return, a reduced rate taxi service (£11.50) from airport. Transfer Bus - £5 per person, please book seats on arrival at hotel. Space is subject to availability, outside these hours and on return taxis can be booked at clients own cost. There is a choice of restaurant. The fine dining Lion D'or restaurant, The Brasserie restaurant, the Library bar and the White Swan pub which also serves meals. Where dinner is included in the price it will be 3 courses from the Buffet menu in the Brasserie Restaurant. £15.95 per person for a breakfast buffet, If not included in your rate. Club rooms included breakfast in the rate. Hair and Beauty Salon in hotel. The adjacent Acorn Fitness is available to guests and offers Pool, Gym, Tennis and Squash - Closed 25th,26th Dec and 1st Jan. The swimming pool is currently closed until end of April 2019 for refurbishment. The gym is open as normal. Where dinner is included in the price it will be 3 courses from the Buffet menu in the Brasserie Restaurant. Hotel very pleasant,perfect for the airport,little taken aback at the price we were charged for breakfast over thirty pounds and was not worth it.Evening meal good value and enjoyable..
We booked a Superior Room but don't feel the additional cost was justified. Particularly as it had a permanent light on in the entrance lobby which made sleeping very difficult. On checkout we were informed OTHERS had also made similar complaints. Good for holiday parking usually a good price but this time expensive as left it to last minute. Excellent stay. Staff helpful and welcoming. Comfortable room. Location easy to find. Good value for night and parking. Large, comfortable, clean room. Overall atmosphere of the hotel is excellent. Terrible and a relic of a hotel. We changed hotel rooms twice. The first time the room had a terrible smell and was freezing, which we put down to not being used that often, generally only by those like us on this occasion staying for one night and being the furthest room away and no lift. We then moved to a room near the reception, this was even worse. I called the manager for him to take a look as it was appalling. Chipped paint everywhere and just old everywhere and not clean. We suspected staff may sometimes use this room. Third time lucky we eventually were given a room but not a place I would stay again. Whether we stay for one night or seven it is not relevant and standards need to be right through. Always a good experience at the Copthorne. Comfortable accommodation, convenient to airport and very good taxi transfer service. Very pleasant staff. Very conveniently located for Gatwick Airport. Very friendly staff especially in The White Swan. Excellent stay in this hotel prior to our holiday. Parking included in the rate so good value for money. Close to Gatwick and efficient transfer to the airport. I would definitely use this hotel and parking again. Excellent Room, service & friendly, helpful staff. we have stayed at this hotel several times before but this time we were given a small room and the toilet and tv didnt work. they did move us once we told them about our problems. Excellent service on the telephone when booking. The lady was so helpful and sorted what I needed. Great hotel to start off your holiday. Cannot fault FHR's service in arranging booking. 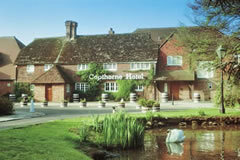 This was the first time we have used the Copthorne Gatwick Hotel. Reception was friendly and efficient Room was comfortable and quiet Evening Buffet was a bit disappointing for my wife (who is piscaterian), but in fairness, it was a Monday night and we did not go in to dine until 9.00pm, by which time the restaurant was empty. Restaurant Staff were attentive and helpful. Will use again - especially as use of the Gym and Pool next door was included in the price. Easy to find.Hotel room & bar not to bad for the money.Dont think I would stay more than one night. Only a very short time spent at the hotel. Room was clean but a little dated. No time to use bar or restaurant facilities. Parking arrangements, especially as disabled, were excellent. Nobody available to help with luggage on arrival. please note:- Transfers run to the airport every hour between 04:15 and 23:15 outside these hours taxis can be booked at clients own cost - the local taxi company rates start from £11.50 (subject to change) each way. Transfer Bus costs £5 pp, please book seats on arrival at hotel. Space is subject to availability. On return, a reduced rate taxi service (£11.50 subject to change) from the airport to the Hotel can requested by calling 01293 429429. Spires Hair and Beauty Salon in hotel - pre book treatments including massage, waxing, manicure, pedicure, spray tan etc. on 01342 716925. The adjacent Acorn Fitness is available to guests and offers Pool, Gym, Tennis and Squash - Closed 25th,26th Dec and 1st Jan. The swimming pool is currently closed till the end of April 2019 for refurbishment. The gym is open as normal. Also on offer payable on arrival at hotel - Pizza and beer promotion at a cost of £13.95 (inc vat) per person the pizza's are 12inch stone baked with a variety of toppings and a house beer.